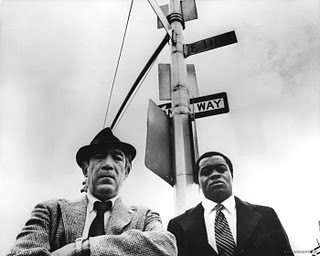 ‘Across a 110th Street’ is a 1972 film directed by Barry Shear, and starring Anthony Quinn and Yaphet Kotto. I hadn’t heard of the film (though I’d heard the song) until a trailer festival I went to a few months back. The film looked gritty, violent, and right up my alley, so I threw it on the Netflix queue, and finally checked it out. The film takes place in New York City, it opens with a shot of a suitcase in the backseat of the car. The suitcase travels uptown, into Harlem, and is brought into a slummy looking flat where a few bookkeepers are waiting to hand off what is likely to be the weeks profit. There is a knock at the door, and the criminals look through, and see two police officers. They cover the money and open the door, looking to payoff the beat cops. What happens next? Those “cops” shoot up the entire room, and steal the money, $300,000 dollars. We then meet Captain Mettelli (Quinn), a racist Italian-American cop, who is forced to work with the by the book Lieutenant Pope (Kotto), a black cop whose risen in the ranks of the precinct. The film is violent, though, some of that violence hasn’t aged well, its forgivable, because the story is actually quite entertaining (if dirty crime stories are your thing). Some of the blood might remind you of another quite notable 70s film, Taxi Driver. From what I’ve read about the film, the camera used during production allowed for quite a bit more hand-held shots then was the norm in its time, giving the film a look that is much more common these days. The film deals with a lot of issues regarding black and white relations in New York City at the time, and definitely is not your typical “blaxploitation” film. Its a very serious film, and definitely deserves a higher place among 70s cinema. ‘Across a 110th Street’ pulls no punches, its brutal to the very end. The films resolution perhaps is an echo of the very life that was depicted in the film, people will die, and nothing will ever change.